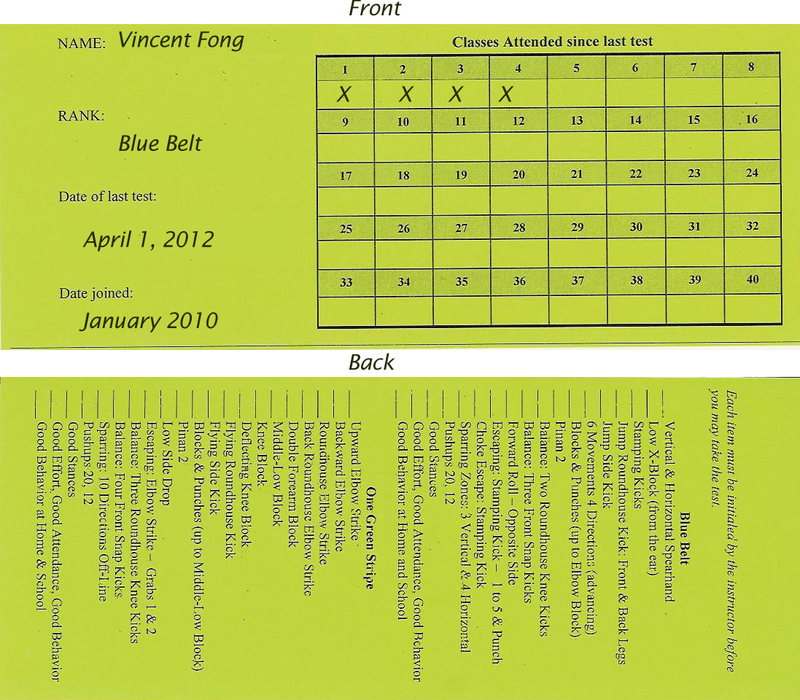 « Belt Tests/Gradings – What’s the Best Way? This entry was posted on July 10, 2012 at 1:10 pm and is filed under martial arts for kids, Martial arts instruction. You can subscribe via RSS 2.0 feed to this post's comments. We introduced attendance cards for 4th Kup and upwards in LCTKD a year or so ago, and it has been really successful. The instructor has to sign the card each class, which gives a chance to speak to the student about attendance, and other things. From the beginning, we’ve emphasised that it is to help the student to keep an eye on whether they are doing what they need. We have had a very slight problem with students thinking that they were ready to grade when they were not; although the fact that they had logged the hours was part of that, it was not the only part. So we’ve also introduced an instructor mentor scheme for higher grades, to increase the interaction with younger students. “Yet they want that rank. They just don’t understand they have to earn it; they don’t get it that they aren’t earning it simply by showing up for class.” So true Didi! They sometimes come in the week after they missed a grading and say, “I need to get my orange belt.” I tell them, “You have skipped a few steps. First of all, you ask if you can make up your grading. Second, you do your best on your grading. Third, if the other two steps are done correctly, you will be awarded your orange belt.” It is not automatic.